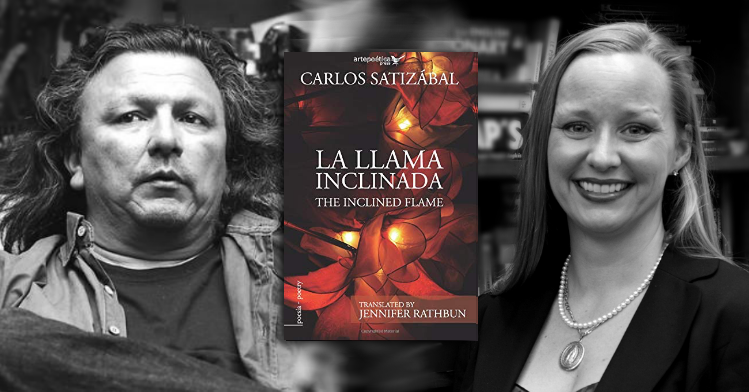 An ardent, bilingual, poetry collection by the Colombian poet Carlos Satizábal and translator Jennifer Rathbun. La llama inclinada / The inclined Flame published by Artepoética Press is a link between death and hope—an unforgiving flame that burns all and everyone in its path. Yet, like a bright sunrise, it promises a new beginning. We will make new paths over the flooded jungle. There will be other fields and good seeds to plant. and every morning we will drink freshly brewed coffee. We are the fleeing ones that have never left. The ones that never leave. Like a string of hope the speaker places symbols of life—birds, nature, and songs—that echo throughout the book. The reader also encounters historical characters such as Shakespeare and Bach, dialogue, cities, Pre-Columbian references, and range of human conditions including sorrow, survival, love, beauty and aspirations. Like actual fire, La llama inclinada / The Inclined Flame can be both tragically painful and illuminating. Carlos Satizábal is a poet, actor, and theater director. His poetry collection, La llama inclinada won the National Prize for Unpublished Poetry in 2012. Additionally, Satizábal has been honored with the City of Bogotá Dramaturgy Award for Ellas y La Muerte: Sueño de tres poetas, the Ibero-American Prize for Dramatic Texts -CELCIT 40 years- for his essay Ensayo del eterno retorno femenino, and the Ibero-American Prize Pensar A Contracorriente for his essay Fragilidad y Lejanía. He works in the Colombian Theater Corporation in the Alternative Festival and Women in the Scene for Peace Festival, and with the Tramaluna Theater. Jennifer Rathbun is the translator of multiple poetry collections including Santuarios Desierto Mart / Sanctuaries Desert Sea by Mexican author Juan Armando Rojas Joo (Artepoética Press, 2015), Afterglow / Tras el rayo by Mexican author Alberto Blanco (The Bitter Oleander Press, 2011), Rio vertebral / Vertebral River by Juan Armando Rojas Joo (Pecan Grove Press, 2019), among others. Rathbun is coeditor of the poetry anthologies Sangre mía / Blood of Mine: Poetry of Border Violence, Gender and Identity in Ciudad Juárez (2013) and Canto a una ciudad en el desierto (2004). In addition, her poetry, translations and articles on Contemporary Latin American Literature appear in numerous international reviews and journals. La llamada inclinada / The Inclined Flame is a publication by Artepoética Press. Click here to purchase.